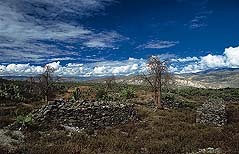 Huamanga, the capital of Ayacucho department, was christened in January 1539 with the name San Juan de la Frontera. The weird machinations of fate have ensured, over the next four and a half centuries, Huamanga would play a part in events that have shaped Peru's history. Francisco Pizarro ordered a city founded at this spot after realizing it was a main stop-over on the imperial road that took travelers from Cusco, the Inca capital, to Lima on the coast. It was the same strategic location on the long haul from the coast to Cusco that ensured the city's rise to prominence during the times of the viceroys; that and the fact that chroniclers raved about its scenic beauty and hospitable climate. "It is always spring, with her bright skies and hale airs," wrote the Carmelite monk Antonio Vásquez de Espinoza in 1615, reiterating the words of a dozen others. So captivating were Huamanga's skies and scenery that when the great mine of Todos los Santos was discovered in the neighboring region of Huancavelica in 1580, that none of the prospering mine owners wished to move there; on the contrary, the riches produced in cold mining town financed the construction of splendid religious monuments and fine mansions that stand in Huamanga to this day, occupied at various times by conquistadors, viceroys and liberators. When Peru decided to shake off the yoke of Spanish rule, Huamanga also hosted the final battle of the South American War of Independence on 9 December 1824 at the Pampas de Quinua, a mere eleven miles from the city. The date is commemorated every December with a reenactment of the battle. Hundreds of the townspeople don period costumes to restage the fighting at the scene of the battle. 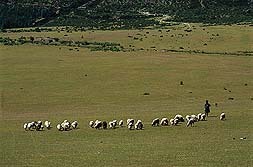 Huamanga has also long been famous as an influential university town. San Cristobal University of Huamanga was founded in the Plaza de Armas of Ayacucho on 3 July 1667, making it one of the oldest centres of learning in the Americas. A few centuries later, the events at this university would shatter the peace of Huamanga by giving rise to a peculiarly sickening brand of violence. It was in the lecture halls of San Cristobal that a stranger to the town called Abimael Guzman founded one of the most lethal terrorist movements the world has ever known. In the eighties, the name Ayacucho and the department capital, Huamanga, achieved international renown as the bloody centre of Shining Path operations. Everything the Shining Path did had such a profound effect on Huamanga and the country, that pre- and post-terrorism Peru are like two different cities. However, as it appears that Huamanga's destiny is to play a vital part in the country's history, its rebirth after years of bitter violence stands as one of the symbols of peace in Peru today. The days of violence cast a pall over the true Ayacucho - the beautiful streets, bright skies, joyful feasts, time-trapped architecture and of course, hospitality of its residents and mild weather. Now, visitors are returning again. Huamanga is also known as the city of 33 churches, resilient structures that date from the first century of the viceroyalty. The Church of San Cristobal, built in 1534, is the oldest in South America. La Merced, built in 1540, is the second oldest. The church and convent of Santa Clara are again attracting tourists, who come to gaze at their pulpits, altars and priceless oil paintings by 16th and 17th century Flemish and Sevillian artists. The Cathedral, built in the main square between 1612 and 1672, is a fine example of colonial architecture. Its 16-bay vault is supported by a nave of eight stone pillars. Holy Week is the most important feast in Ayacucho. Visitors and townspeople alike participate in processions of unparalleled beauty, in which shrines are carried through the streets in remembrance of Christ's passion and death. One of the more impressive Holy Week processions is known as the day of the "Meeting" or Holy Wednesday. The procession carries the effigy of the "Cristo Nazareno" from the church of Santa Clara. The effigy shows Christ wearing a crown of thorns bent over under the weight of heavy wooden cross. The effigy looks so real that a popular local legend has grown up around it, passed on by word of mouth since the 17th century. The story goes that sculpture was made by two young men, to whom the Julcamarca parish priest gave lodging one night. It is said the two men were angels who carved the figure in a single night and left very early the next morning. Every year, faithful bearers carry the litter covered with a carpet of flowers and eventually meet up with the Virgin of Sorrows, which is carried in another inspiring procession from Santo Domingo Church. The Holy Week Feast in Ayacucho is considered so important that each day's rituals compete in majesty with those of the previous day. One, known as the procession of the holy sepulcher on Good Friday, recreates the scene of Christ in his tomb. The city lights are snuffed out and the only illumination comes from a glass and wood case in which Christ is lying on a bed of white roses. A host of faithful followers dressed in black accompany him, carrying thousands of burning candles. A band of musicians play an evocative, heart-wrenching melody. A few hours before the procession devotees and visitors alike crowd into Santo Domingo Church, where the body of Christ is place on a white shroud in the central nave. A line forms of those who wipe the Lord's wounds in a moving demonstration of devotion. The feasts, however, are not all religious. February is carnival month, marked by a three-day celebration, in which people hold tree-cutting feasts la Yunza. They dance around a tree laden with presents, before chopping it down. All over the city, bands of musicians compete with each other in the streets, exhorting the men and women to dance with increasing abandon, while boys and girls chase each other, throwing water bombs and streamers. There is a lot more to Ayacucho. The city's "renaissance" in the past six years are revealing the peculiar, enchanting world that hides in the streets and alleyways of a colonial city modeled on the classical cities of Spain. The wide Plaza de Armas, ringed by doorways and streetlamps, is one of the largest and most beautiful in Peru. Indeed, it is a truly unique experience to watch the sunset from one of its benches or observe rain fall on the Plaza from the snug shelter of a balcony. Ayacucho offers a variety of indigenous art such as the vividly colorful detail of its highly skilled artisan's altarpieces the characteristic Retablo, religious and popular images shaped in gesso and set inside carefully painted wooden boxes; miniature white figures carved from Huamanga stone; non glazed pottery from the village of Quinua; textile hand weavings of naturally dyed wool . Open-air fairs in which it is still possible to barter goods, have made a comeback. Stroll through the streets. Red tile added a hint of color to the whitewashed houses, their wooden balconies and open hallways. The famous Peruvian writer Julio Ramón Ribeyro, who lived in Huamanga in the early sixties, used to say that the best cities are those you can see completely on foot and this is probably one of the best. The city lies under the burning orb of the mountain sun set on a canvas of bright azure blue. The passage of time, not even its sometimes painful history, has not diminished its beauty and magic. Ayacucho is one of the best kept secrets of Peru.